1.Copy and paste the image onto your post. 2. Copy and paste these rules onto your post. Err... Yes, I do believe I just did that. 3. Thank the person who tagged you. 4. Answer the 5 riddles that are provided by the lovely person who tagged you. 5. Tag 5 or more bloggers. 6. Provide 5 different riddles in your post for the people you tagged. 7. Comment the link to your post on each blogger's blog or let them know in some way or another. 8. 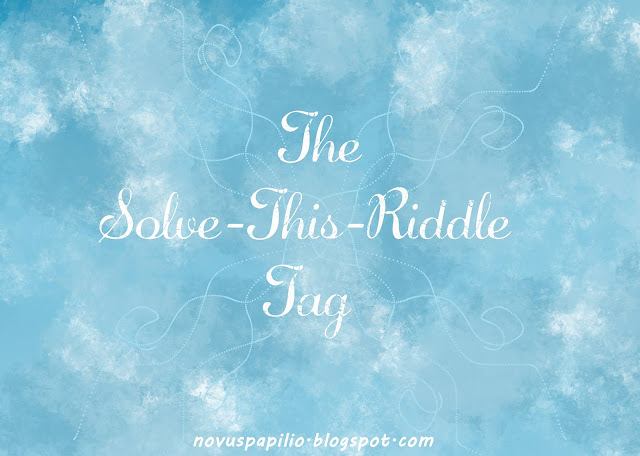 After a week from when posting this tag, comment the answers to your riddles on your own post. Thank you so very much Jane and Clare! 4. Answer the 5 riddles that are provided by the lovely person (or people, in my case) who tagged you. 1: This old one runs forever, but never moves at all. He has not lungs nor throat, but still a mighty roaring call. What is it? Hmm... I think I know the answer to this one! 2: What meets you at the end of everything? I might have an answer for this one. 3: What do the letter 'T' and an island have in common? 4: What has a head, a tail, is silver and has no legs? 5: What do you throw out when you want to use it, but take in when you don't want to use it? Riddle One: A man went on a trip with a fox, a goose and a sack of corn. He came upon a stream which he had to cross and found a tiny boat to use to cross the stream. He could only take himself and one other - the fox, the goose, or the corn - at a time. He could not leave the fox alone with the goose or the goose alone with the corn. How does he get all safely over the stream? Riddle Two: A farmer in SA owns a beautiful pear tree. He supplies the fruit to a nearby grocery store. The store owner has called the farmer to see how much fruit is available for him to purchase and ask if he can pick it up in five days time. The farmer knows that the main trunk has 24 branches. Each branch has exactly 12 boughs and each bough has exactly 6 twigs. Since each twig bears one piece of fruit, how many plums will the farmer be able to deliver? And I thought I was finished math for the day... Luckily I had a Zach with me! Riddle Three: Why was the belt arrested? Ahahaha.... I have absolutely "no clue." 'Might know and I might not... This could be a lot of things. Riddle Five: Can an English man legally marry his widow's sister? 5. Tag 5 or more bloggers (Please please please don't tag me back!). I hereby nominate Corey at CJR Odyssey! The First: There were 10 horses and 9 paddocks. How do you fit all 10 horses in the paddocks with only 1 allowed in each paddock? The Second: When you don't have enough of me, you feel a kind of gloom. But when you are using me, it is time that you consume. What am I? The Third: Imagine you are swimming in the middle of the ocean and a bunch of hungry sharks surround you. How do you get out alive? The Fourth: A man who couldn't speak went into a store to buy a toothbrush. He pretended to brush his teeth with his finger to tell the cashier what he wanted. The cashier understood and the man went home with the toothbrush. Then, a blind man came into the store wanting to buy sunglasses. How could he tell the cashier he wanted sunglasses? The Fifth: What has rivers but no water, forest but no trees and cities but no people? Hmm... I didn't think of that! (Probably because I had already seen the answer.) It would make sense if there was a boat next to you though... Especially if you're in the middle of the ocean! I'm just gonna go straight to the point and put my answers down because I just realized this is kinda one week over due... Teehehe... Oops. Riddle Two: The letter 'g' ? Riddle Four: A coin... I think. Riddle One: Now, I'll admit I had to look this one up because I could not figure it out. Apparently you take the goose over first, then the fox, bring the goose back with you so the fox doesn't eat him/her and then dump the goose back at the starting point and then your mission is accomplished... I hope that made sense! Riddle Three: Because it held up the pants? Riddle Four: An echo or a breath... I'm not really sure!